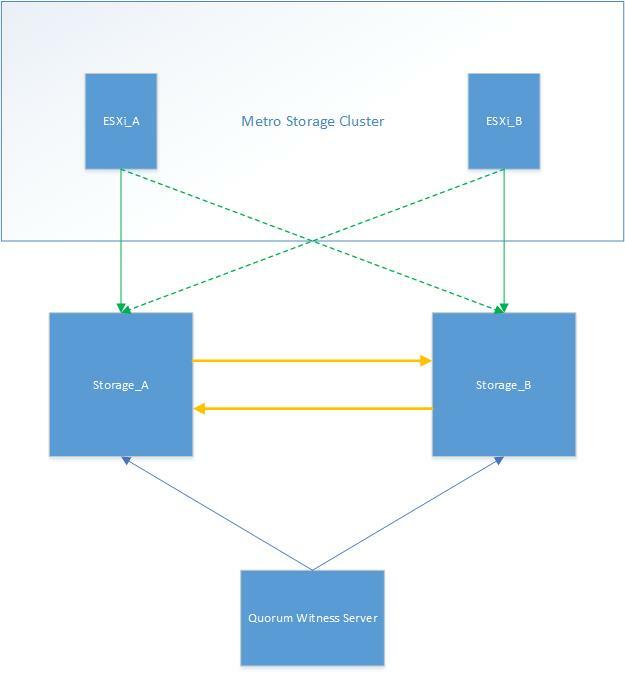 vMSC is a certified configuration for stretched storage cluster architectures. A vMSC configuration is designed to maintain data availability beyond a single physical or logical site. A storage device configured in the vMSC configuration is supported after successful vMSC certification. The benefit vMSC provides is simple. When a disaster happens at one datacentre, HA kicks in and fails over virtual machine to another datacentre automatically. It’s a normal vCenter server cluster with HA/DRS enabled but half ESXi servers are in one datacentre and the rest are in another datacentre. We deployed vMSC with HP 3PAR peer-persistence functionality (more details could be found here). Before putting it into production, performed functional testing to ensure it works as expected and during a certain testing, found an interesting behaviour with 3PAR. Virtual machines are uniformly accessing datastores. For instance, virtual machine running in ESXi_A uses Storage_A. Disk.AutoremoveOnPDL is set to 0 and VMkernel.Boot.terminateVMOnPDL to true. A script attached below could be used to validate these two advanced settings. Performing the test, interesting behaviour was noticed. All ESXi servers in Datacentre_A were not responding. Re-connecting ESXi server didn’t work, they were hanging. The log was telling that ESXi servers were keep trying to search for the available path and eventually, it failed to find one. Running esxcfg-mpath -b outputted 4 dead paths and 4 standby paths. How does ESXi know that it should stop looking for active path? It should receive either PDL or APD sense codes. The next element I looked into was PDL sense codes in the vmkernel.log. I used vCenter Log-Insight to filter by H:0x0 D:0x2 P:0x0 Valid sense data: 0x5 0x25 0x0 but couldn’t find any. To summarise what happened, when Storage_A stopped all I/O from ESXi_A, it did not send PDL sense codes to ESXi_A. As a result, ESXi_A was keep looking for active paths on and on and finally, it failed. This put ESXi servers in not responding state. The only way to fix this issue was to reboot the affected ESXi servers. After having a chat with 3PAR engineers, this is a known behaviour and it’s by design meaning that 3PAR won’t send PDL sense codes to ESXi servers when it stops all I/O. This test scenario is a very special case. 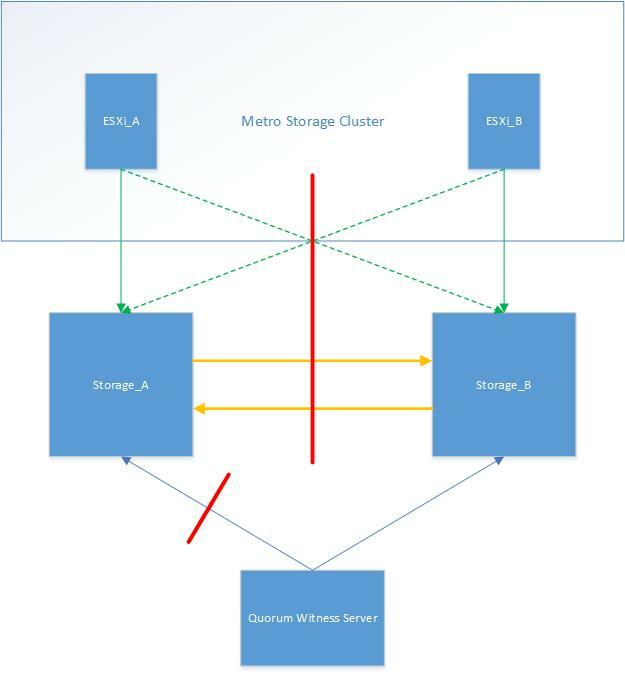 Losing network connection from the Quorum witness server to only one 3PAR and losing only FC ISLs between 3PARs is highly unlikely to happen. However, important element found in this test is that 3PAR doesn’t send PDL sense codes when it stops I/O to prevent data corruption. So in future, if this happens, rebooting all ESXi servers should be executed ASAP instead of waiting for HA to failover virtual machines automatically.